GALION — Students at Galion Intermediate School are taking advantage of a new opportunity to learn outside of classroom this school year. 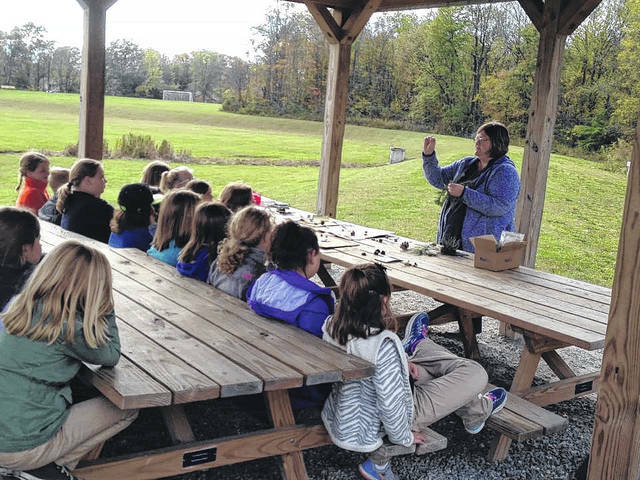 The newly-formed Outdoor Club has been a larger success than fourth-grade teacher Neal Rinehart and librarian Adam Lehman could have anticipated. Lehman earned an Eagle Scout badge as a young man, so his appreciation for the outdoors is deep rooted. Presented to the students as an opportunity to learn more about fishing, hiking and even geo-caching, they had no idea what to expect at their first meeting, but were hoping to possibly have 20 to 30 kids in attendance. More than 100 showed up, and they haven’t stopped coming. Due to the large response, the group is has been broken up by grade levels and every couple of weeks in order to keep the number of students at a manageable size. So far, the kids have been exposed to fly-fishing, knot-tying, and tree identification. With the winter months ahead, they will be introduced to fire building, survival skills and snow tracking. Galion resident and intermediate school parent Chris Stone, who travels to Virginia to participate in survival training, will be involved with the Outdoor Club to teach and train. They also plan to have Galion teacher Bryan Summer speak to the group about astronomy. Summer is very active with the Warren Rupp Observatory in Mansfield and provided students with eclipse glasses to view the solar eclipse on the first day of the school year. Another resource for instructing the students is intermediate school teacher Charlie Miller, who has a lot of experience with fly-fishing, as well as archery. Rinehart and Lehman. along with Miller and physical education teacher Matt Tyrell, traveled to Athens to complete some course-work in order bring the opportunity for archery into the school as a whole. This Saturday, the Outdoor Club is having a Fall Fishing Picnic at Amick Reservoir from 11 a.m. to 1 p.m. Students are being asked to bring their family and enjoy fishing, nature hikes, disc-golf, geo-caching and more. Hot dogs and drinks will be provided. Courtesy photo One of the topics tackled by a new Outdoor Club at Galion Intermediate School is tree identification. Other items on the agenda for the club are fishing, archery, geo-caching. In fact the group is having a fishing picnic Saturday at Amick Reservoir. https://www.galioninquirer.com/wp-content/uploads/sites/38/2017/11/web1_23140292_10212283059129965_661614941_n.jpgCourtesy photo One of the topics tackled by a new Outdoor Club at Galion Intermediate School is tree identification. Other items on the agenda for the club are fishing, archery, geo-caching. In fact the group is having a fishing picnic Saturday at Amick Reservoir.